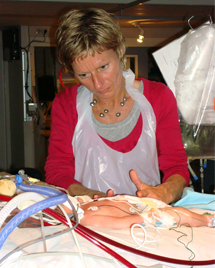 I trained as a nurse at Bleuland Hospital, Gouda and then specialized in Pediatric Intensive Care Unit. I have been working in the Pediatric Intensive Care Unit of Sophia's Children's Hospital/ Erasmus MC in Rotterdam since 2003. In 2006 I began a Masters Degree in Evidence Based Practice. To graduate I had to do research and because of my growing interest in complementary care I went to Scotland in 2006 to do a course in the ‘M’ Technique with Dr. Jane Buckle. Her way ‘to bring the care back in the cure’ inspired me to write a research proposal and in 2008 we started with a randomized controlled trial on the effects of ‘M’ technique massage on postoperative distress in infants. Slowly the interest for the ‘M’ technique massage on the Intensive Care Unit increased and a few colleges also took the practitioner course. At the moment we use the ‘M’ Technique massage on critically ill children and babies and we also teach some of the strokes to the parents if they are interested. Because the adult version of the ‘M’ technique was not suitable for tiny babies, I worked together with Dr. Buckle to create a modified version, the baby ‘M’. I became an 'M' Technique instructor in 2009 and I am happy to travel to teach either the adult 'M' or Baby 'M'.